A quick search on Flickr for a Lambrusco image I could use for a post came up with many interesting options. Like most times when hunting for a wine-related image, you never know what you’re going to find. I’m going with this one. An iPod run through a docking station cloaked by cardboard resembling a beat-up old boom box, along with a bottle of Lambrusco on a picnic table? I’ll drink to that. And though I can’t discern the brand of Lambrusco (and hope that it’s a high-quality example), I applaud the spirit in which these folks are enjoying Lambrusco. You’re outside, you’ve got tunes, and hanging out with friends (not pictured, but I’m going to assume this is the case). What better red wine to enjoy than a chilly bottle of fizzy and fresh Lambrusco? Not the Kool-aid concoction you see on the bottom recesses of a grocery store shelf, but rather a red wine that is really fun to drink on its own if you must have red wine in the summer. Ask a knowledgeable wine pro at your local shop for a dry version. (Though I do like the ones with a touch of sweetness.) It’s also one of the most fantastic food wines in the world. I know you like pizza, and pizza and Lambrusco are in love. An assorted plate of cured meats is also a heavenly match. I have to admit that I haven’t been thinking about Lambrusco lately until I was recently contacted to give my thoughts to Seattle Met’s Sauced blog. 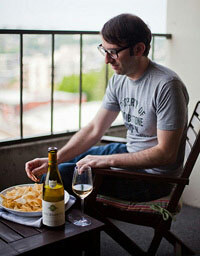 Big thanks to Food and Drink Editor Allecia Vermillion for including them. And also thanks to Allecia for alerting me to the presence of a dessert at Oddfellows Cafe and Bar that uses Lambrusco in a most unique way: a gelatina with Lambrusco and Bing cherries, topped with black pepper and Chantilly cream. Sounds like a must-try to me. So which is more “OG”? The boom box or Lambrusco? You can also read more about Lambrusco on Foodista: The Best Red Wine For Pizza is Served with a Chill. 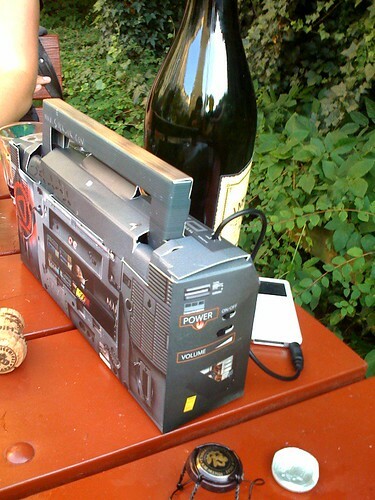 Photo titled “Boombox og lambrusco” (greatest photo title ever) courtesy Gullig.